Welcome to our Online Poker Guide. In this section you will find answers to common poker questions which will help you get started playing poker online. What is an Online Poker Bonus & How do I get one? When you are looking to play online poker, you need to have a clear understanding of how the online poker sites work. All poker sites differ to a certain extent and offer different features to their competitors. You want to know what to look for on the poker sites and be able to log onto them and begin taking advantage of those great features right away. This section is all about providing help to you and answering any questions you may have related to online poker and how to navigate and take advantage of the features, benefits and software offered by poker sites. Check out the above list of Poker Guide Articles in this section where we have answered the most common poker questions, problems, and information requested to us by our users. Each article should provide you with enough information to help you solve that particular question. If you have any subject that we haven't covered which you would like us to look at then contact us, and we'll add the subject to our pending list. Below are a few of the most frequently asked questions which we have answered in a quick fire style to allow you to be able to go online and jump right into enjoying all the benefits of playing poker at a poker site. Where can I find information about a Poker Site? All sites will offer a slightly different package, from games offered to bonuses. You should first check out our poker sites section on the particular brand as we produce detailed guides to the leading poker sites which will cover what they offer, how to earn the bonus they offer and how their player loyalty scheme works. Each poker site will also have a home page when you log onto their poker software. To see this you will first have to download the software using one of the links on this site. The home page of the software will introduce you to the site and give you a good idea of what you can expect from it. Most will tell you a little bit about the games and offer you information regarding some of the bonuses and promotions. Where can I find information about the Games offered? Once again our poker sites section will give you all that information, but once you have downloaded the software for your chosen poker site then there will be a tab that you can select to view the Game section. This will tell you all about the games you can play there and allow you to access the lobby which is a list of available games. The lobby is where you will go to choose the game you want to play. A good poker site will make it easy for you to navigate this section, as you will be using it a lot. If it is not easy to navigate then it can very quickly get confusing and this makes it more difficult for you to get started playing. How do I get the Bonus that the Poker Site is Offering? All poker sites will offer an incentive for new players to open an account and start playing at their site. The size of the bonus and the procedure for "clearing" the bonus can be very different from one operator to the next. Not many poker sites will give you the bonus up front as this can be taken advantage of very easily and very quickly would be abused by fraudulent players signing up just to get the bonus and with no intention to play. So each room will have a process for a player to "earn" the bonus by clearing it in stages. Usually this is done by simply playing poker, and the bonus cash is released to you in stages as you reach milestones. 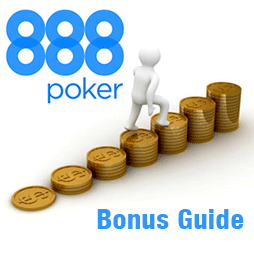 We have published a detailed bonus guide for each leading poker site in our poker sites section which will explain to you exactly how you can claim and clear the bonus offered. It will introduce you to the different bonuses and promotions that you can enjoy when you become a member of that site, some of which will be open to just about anyone and others will have requirements that a player needs to meet before they will be eligible for them.